Want to make your donors feel like a million bucks? 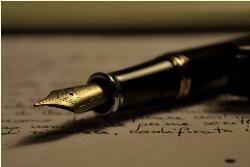 "Handwritten notes are the gold standard," says Lynne Wester, author of the The 4 Pillars of Donor Relations. "Donors rarely get those personal touches." Here are some simple truths: When you give someone a gift, you expect them to say "thank you." And when a donor makes a contribution to your nonprofit, you should always say thank you. Always. And always in writing. Your thank you letter doesn't have to be handwritten. It might be a typed letter. It could be an email. I do agree with Lynne, though. A handwritten note is special, and it does make you stand out. Whatever medium you choose, your "thank you" should have some basic elements. Follow these four simple steps and you'll take your thank you letters from average to All Star! Start by being specific. Bonus points if you don't start with the words "Thank you." Boring: Thank you for your gift. Better: Thank you so much for the gift you sent for (your event or campaign name here). Best: You have no idea how much we appreciate your gift to (your event or campaign). Acknowledge how the gift will be used. Tell the donor why their gift was appropriate, useful, and/or needed. Again, the more specific you can be, the better. Help your reader visualize exactly how their gift will be used. It's easy to write something generic like "We appreciate your generosity" (or thoughtfulness or kindness or…). Instead, express a sentiment that is personally meaningful to the person you're writing or unique to the gift-giving event. Restate your thanks again somewhere before signing off. These four building blocks can be stacked in any order. And this formula works in any circumstance and for any gift. Specific. Instead of thanking me for the generic "wedding present," the bride thanked me for "the mugs in our china pattern." How the gift will be used. "Will is a huge coffee drinker, so he was especially excited about this gift." Attitude of gratitude. 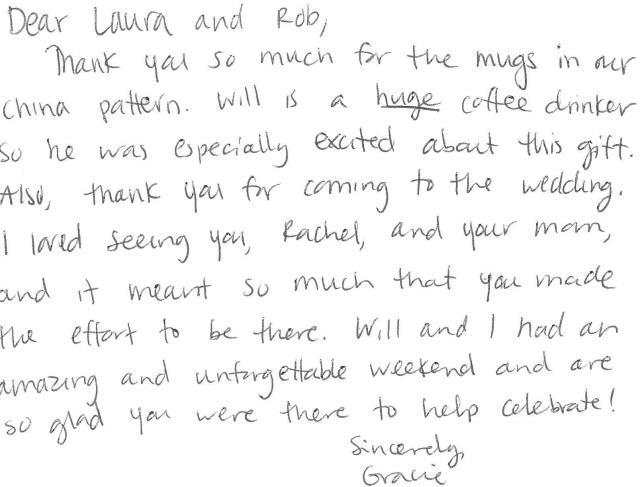 The wedding weekend was "amazing and unforgettable and we're so glad you were there to help celebrate!" And it was, in fact, my pleasure to be there to help the happy couple celebrate. Now, look at this thank you for a business consultation. Four sentences. Each one has a purpose. It's simple. And it works. Specific. "Thank you so much for your time today!" Attitude of gratitude. 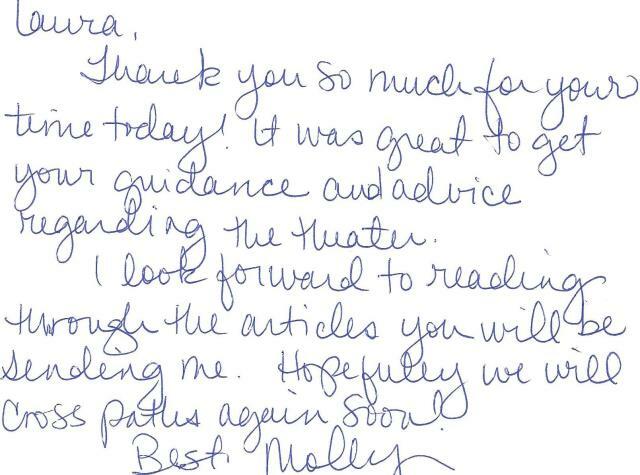 "It was great to get your guidance and advice regarding the theater." How the gift will be used. "I look forward to reading through the articles you will be sending me." Personal note. "Hopefully, we will cross paths again soon." 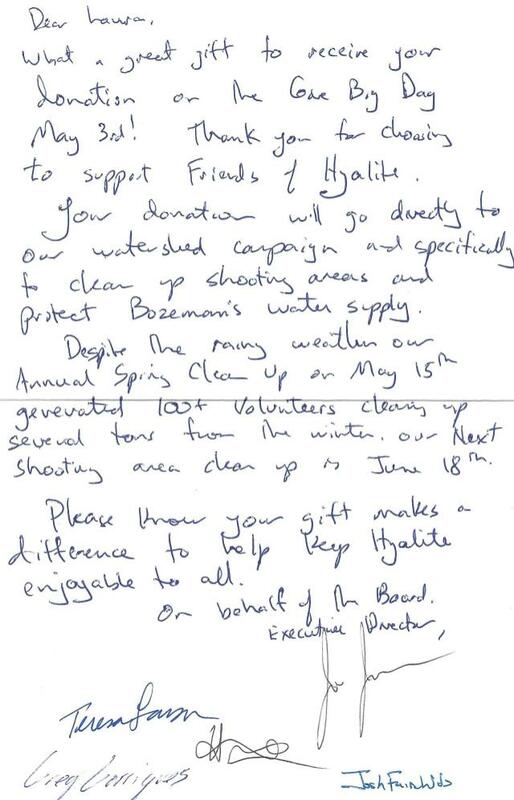 Lastly, here's one of several wonderfully written thank you letters that I received from local nonprofits after supporting them during the community-wide	Give Big Gallatin Valley event. Specific. "What a great gift to receive your donation on the Give Big Day  May 3rd!" It doesn't matter if you're writing to a friend, a first-time donor or your great aunt Edna. When you follow these four basic steps, you'll have written a stellar thank you letter. And you know what they say: Practice makes perfect! Read this short post about thank you letters: The Good, The Bad and The Ugly. Learn what nonprofits are doing well, what they could be doing better and what they're not doing at all. Use this checklist to make sure your thank you letters (and other communications) are donor-centered: Is Your Organization Donor-Centered? Keep this Donor Thank You Guide handy (and check out page 14 for thank you ideas that go beyond the written word and will surprise and delight your donors).